Cons: Speakers are weak compared to the rest of the system, but not bad, Could use a bigger hard drive. Summary: Hands down, this is the best value in a no compromise full power multi-media laptop. This should replace your old desktop pc, or be your first pc if you don't own one yet. What can I say about the Acer Aspire 6920-6422? Intel dual core 2.5mhz processor - check, 4gb of ram - check, dedicated nVidia 9500 video card with HDMI - check, Blue-Ray player - check, Bluetooth - check, Wireless N - check. All this packaged in a beautiful shell that you can't take your eyes off of. This laptop is designed to do everything a PC is supposed to do. The core elements of this laptop should give you years of use for any office application, graphic intensive multimedia applications, with HD movies and gaming in all it's glory. The combination of the dual core 2.5ghz processor, 4gb of ddr2 ram, and super fast nVidia 9500 video card is the perfect combination for the current Windows Vista operating system. It's the only laptop in this price range that puts all these things together in a beautiful and well made shell. Without getting too technical with speed charts, features, and benchmarks, it's suffice to say that the Intel processor in the Acer Aspire 6920-6422 if one of the best available today. Faster than any other CPU in almost any laptop in any price range. It's going to breeze through Microsoft Office applications like Excel, Word, and Powerpoint. Plenty of power to handle rendering and processing in any graphic application such as found in Adobe CSx suites. It will even power through any processor intensive strategy games giving you fast response times. Trust me, the processor will not be the weak link in your laptop adventures. The next link in the chain is the memory. With 4gb of DDR2 ram, Windows Vista will have plenty of room to open multiple office applications, surf the web, and check email all at the same time. You'll be able to switch between any of these applications with speed and confidence. For graphic intensive applications, you'll be able to work with large photo files, edit HD video content (like from your camera or camcorder), and seamlessly cut, paste, and undo any kind of multimedia content the typical consumer would ever work with. The final link in the chain is the video card. The Acer Aspire 6920-6422 comes with the nVidia GeForce 9500M GS. This is the laptop version from it's powerful line of desktop video cards. Most laptops use an integrated intel solution that works fine for office applications and watching movies. However, for graphic intensive applications like from Adobe, and gaming, you really need a powerful dedicated video card. The 9500 GS in this Acer does not disappoint. Again, without getting too technical, you'll be able to watch HD movies using nVidia's highly rated PureVideo HD, and play most games at or near their max quality settings. The other nice thing about the video setup on this laptop is that it comes with an HDMI out port. This will let you hook up your laptop to your 60" HDTV and watch Blu-Ray movies in all their digital high definition glory. Now lets talk about all the other specs that make up why this is such a great value. I don't put as much emphasis on the hard drive size as I used too. Until solid state drives become the de facto standard, there is very little difference in the laptop community. The hard drive is your standard SATA 250gb 5400rpm 2.5" drive. Nothing particularly special here. But at 250gb, it's large enough not to leave you wanting for any office application and gaming. For you multimedia users who edit large graphic files like raw photos and hd video, you probably already have an external drive for that stuff anyway. If you don't have one, get one. We all know how hard drives can and will fail eventually, so back up your pictures, movies, and projects to an external hard drive right away. Don't leave stuff like that on a laptop that can be dropped, lost, or stolen, right? Now there are a ton of other features here that I'm going to skim through a bit, but these are the key features that will save you money because they are not normally found on other laptops in this price range. In particular, the built in Blu-Ray drive. You'd pay $200-$400 for one of these separately. Bluetooth built in - you'd pay $20-$40 for this separately. HDMI out - built in and cannot be added separately, so this is really really nice. Digital sound with s/pdif out - you'd pay $60-$100 separately. Then there are the features you find on most laptops in this range such as memory card support, modem for dial up, ethernet, and usb ports. There's also the 16-inch 16:9 ratio display, built-in subwoofer, and touch-sensitive multimedia control panel. Don't let the subwoofer feature fool you. This is still a laptop speaker configuration that sounds better than most laptops, but is still a group of speakers in a thin plastic case. Don't expect to be able to hear this thing clearly in a noisy room, but it does sound great while typing away in your favorite chair. I really like the blu-ray drive, bluetooth, and hdmi port. You can watch blu-ray movies on your hdtv and chat using your cell phone's bluetooth wireless headset on all the voice messaging services or voip like skype. These are the kind of features usually reserved for desktop users who would buy these things as add ons to their pc (like me). If you really wannabe be cool, buy a bluetooth keyboard and air mouse and use your hdtv as your main monitor. Turn your laptop into a true piece of home theater equipment since it already has the blu-ray drive, hdmi, and s/pdif audio. The wireless-n is a nice feature. It's main advantage right now is range. Although it's theoretically 6x faster than wireless-g, it will be a long time before the cable/dsl companies will be able to pump out that kind of speed to the consumer. The theoretical 4x the range of wireless-g is where it's at. If you have a wireless-n router at home, then you'll be able to roam around your home without dropping the signal. Also, even though you won't see any difference in internet speeds, wireless-n offers enough speed to stream HD video content smoothly and transfer files between your laptop and desktop much faster as well. Still, with all these features and power found in the Acer Aspire 6920-6422, I thought of a couple of things that would make this little gem standout just a tad more. For one, a SATA port for external hard drives. Of course you can buy usb external hard drives that offer virtually the same speed, but I prefer using the native SATA interface whenever possible. Most usb drives are really SATA drives with a conversion to usb built in. The only other thing I'd want is the latest dual-band wireless n. It already has wireless n built in, but they have recently come out with a dual band wireless n that can operate on a different frequency. This reduces interference commonly found in homes and offices that have all kinds of wireless devices. If you're on the fence about deciding between a laptop and a desktop, get this laptop. In the long run, you'll appreciate the portability, space savings, and power savings of this laptop without compromising processing power and features. Plus, you won't need to buy a separate monitor ever, since you probably already have an hdtv which can be used as a monitor. 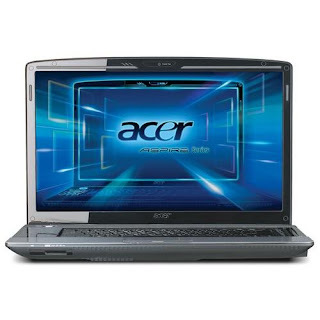 As of this writing, the Acer Aspire 6920-6422 can be found online for $1,395.99 w/Free Shipping!